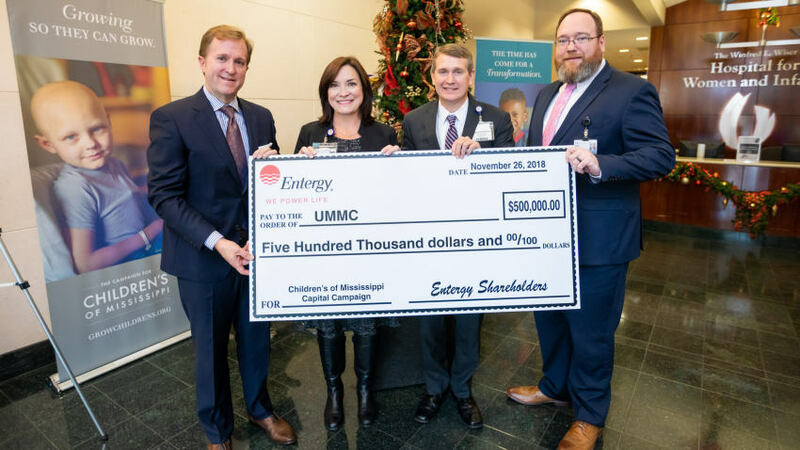 Entergy Mississippi is investing in the families they serve through a $500,000 donation to the Campaign for Children’s of Mississippi. The donation from the company, celebrating 95 years of doing business in Mississippi, was announced Monday in a news conference on the UMMC campus. The campaign, a $100 million effort to help fund UMMC’s pediatric expansion now under construction, has raised more than $67 million since 2016. Entergy Mississippi serves about 449,000 customers in 45 of Mississippi’s 82 counties. Entergy companies employ some 2,200 Mississippians, and more than 1,200 Entergy retirees live in the state. The energy provider’s philanthropic focus is to improve the quality of life in the communities it serves through investing in education, improving the environment and finding solutions to poverty. Entergy Mississippi contributed more than $2 million to over 400 nonprofit organizations in the state in 2017. The pediatric expansion adjacent to the state’s only children’s hospital, Batson, includes 88 private neonatal intensive care rooms. The current neonatal intensive care unit at UMMC was built for about 30 babies but routinely offers care to three times that number. Also included is additional space for pediatric intensive care and for surgery, a department that is quickly outgrowing its current location. When Batson Children’s Hospital patients need imaging such as CT scans and MRIs, they travel inside the hospital about a quarter of a mile to an imaging center designed for adults. In this new construction, a pediatric imaging center will be inside the children’s hospital and will be kid-friendly. An outpatient specialty clinic will be close by, putting experts in pediatric disciplines including cardiology, neurology, urology, endocrinology, gastroenterology and orthopedics in one location on the UMMC campus. For more information or to give to the Campaign for Children’s of Mississippi, visit growchildrens.org.